Thank you, Tillamook for sponsoring this post. For a limited time this fall, try Tillamook’s Extra Sharp White Cheddar Slices! Available at Costco. 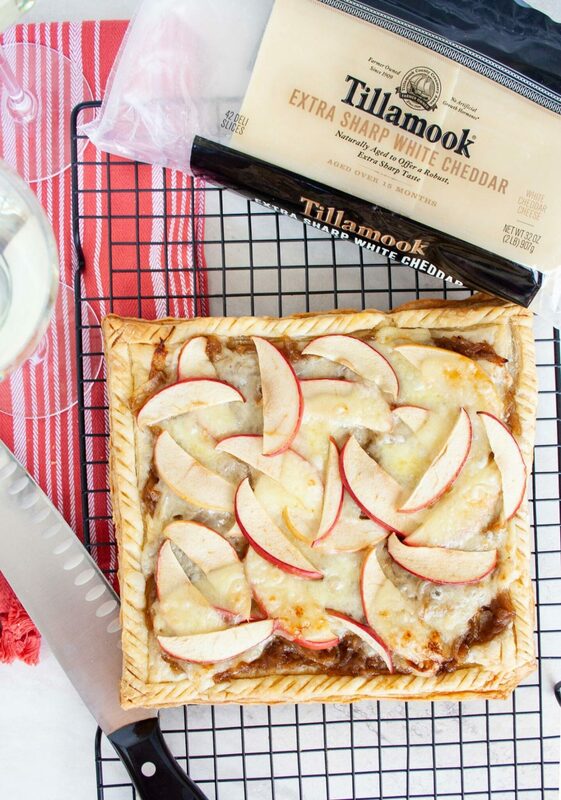 Make fall entertaining easy and elegant again with this go-to savory apple tart topped with caramelized onions and Tillamook Extra Sharp White Cheddar Slices. This is the perfect Thanksgiving appetizer or appetizer for a fall dinner party! I don’t want to jinx anything but it’s actually feeling like fall here in Houston! Which means all the fall activities will begin soon. For us, late fall is normally jammed backed with dinner parties, Friendsgiving, and BYOD wine nights. That stands for “Bring Your Own Dish” and the hosts will supply the wine. Fun right? With the uptick in cooking coming up, it’s nice to have a few good quality recipes that can be easily assembled. That way you get to socializing or working on another dish quicker. Say a Thanksgiving turkey? 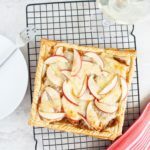 This savory apple tart with caramelized onions and cheddar cheese may be a mouthful but it is the perfect-sized appetizer. It comes together quickly and is perfected around delicious fall flavors. It’s crunchy with gooey Tillamook Extra Sharp White Cheddar Slices and savory sweet onions and apples. Plus its effortless elegance, so be ready to hand the recipe out and be the queen or king of fall BYOD! All that needs to be done in this recipe is to caramelize onions, bake puff pastry, and assemble for another round of baking. 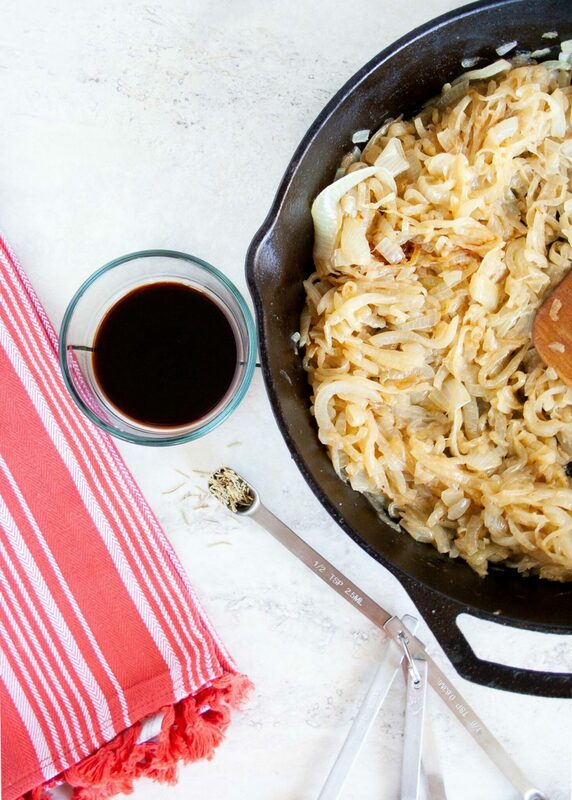 To start, begin by caramelizing sliced onions in butter, salt, and olive oil in a pan on medium heat for 25 minutes. When the onions are halfway done, take frozen puff pastry that’s been thawed by the instructions. Even the edges and then score the pastry. Personally, I score it with a 2cm border and then run 3-4 score lines on the puff pastry inside the border that has been created. Then I score a braid or roping on the 2cm outside border. Throw the puff pastry into a pre-heated, 400-degree oven and let cook for 10 minutes. When 25 minutes have gone by on the onions, toss them with balsamic vinegar, sugar, and dried rosemary. Let it cook for 5 more minutes. The puff pastry and onions should be done around the same times. Then begins assembly. Top the puff pastry with the caramelized onions. Alternating between apples and Tillamook Extra Sharp White Cheddar Slices, stack interlacing layers. The Tillamook Extra Sharp White Cheddar Slices are made with simple ingredients and then naturally aged for 15 months to achieve tangy perfection. This makes them a perfect flavor addition to the sweet apple slices. This sweet and savory combo is just divine! Once the apples and extra sharp white cheddar slices have been stacked. Add the tart back in the oven for a 20-minute bake or until the cheese is bubbling and tart golden. 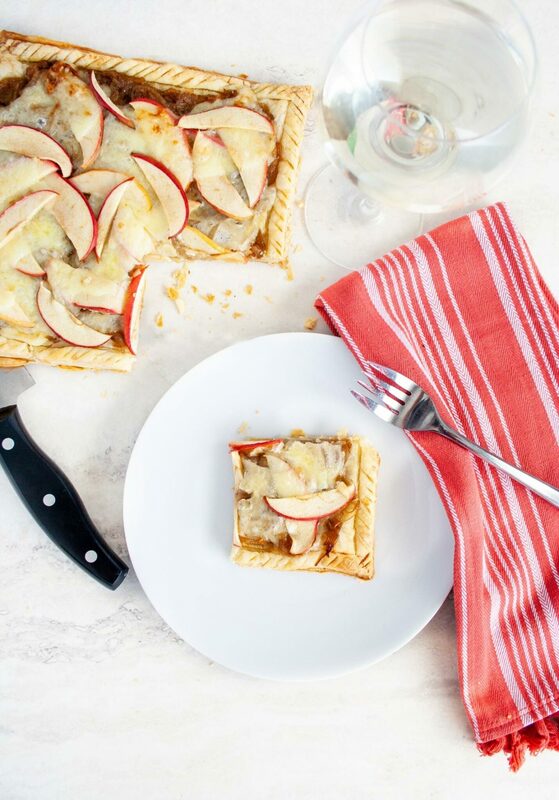 This easy fall appetizer includes topping puff pastry with caramelized onions and layers of apples and Tillamook Extra Sharp White Cheddar Slices. For a flaky and savory tart. Pre-heat your oven to 400-degrees. Slice your onion into thin strips. Over the stove on medium heat melt butter, olive oil, a pinch of salt, and the onion. Let cook down for 15 minutes until golden in color. Pour into the pan balsamic vinegar, dried rosemary, and sugar. Stir with the onions and cook down for another 5 minutes. Remove from heat. Trim the edges and score a 2 cm border from the edge. Score a few lines in the central part of the puff pastry. If you want you can score a braid or detail around the border for an elegant look. Bake in the oven for 10 minutes. Chop your apple into thin slices. Removing the seeds and core. Chop your Tillamook Extra Sharp White Cheddar Slices in half. Within the border of your puff pastry add your caramelized onions to the top of the puff pastry. 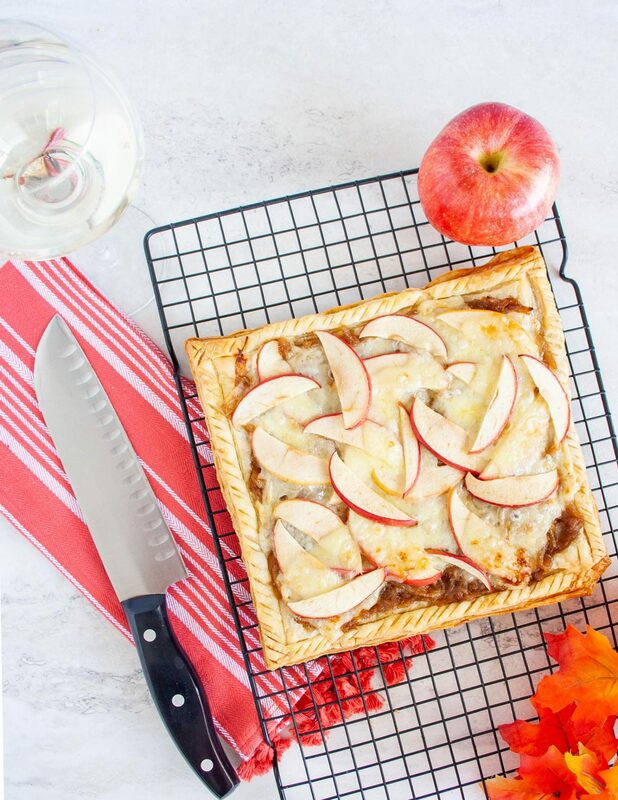 Layer apples and Tillamook Extra Sharp White Cheddar Slices on top of the caramelized onions until you've covered the inside border of the puff pastry. Add your puff pastry back into the oven for 20 minutes or until the puff pastry is golden brown and Tillamook's Extra Sharp White Cheddar Slices are bubbling. Let rest for 10 minutes, cut and serve. Don’t you love how flaky this is? It makes the appetizer feel light and just right for starting a dinner. Plus the fall flavors are some of my favorite. Really anything that looks elegant and brings something unique to the table, is a favorite right? Those are the dishes we ultimately reach for when someone asks us to BYOD. 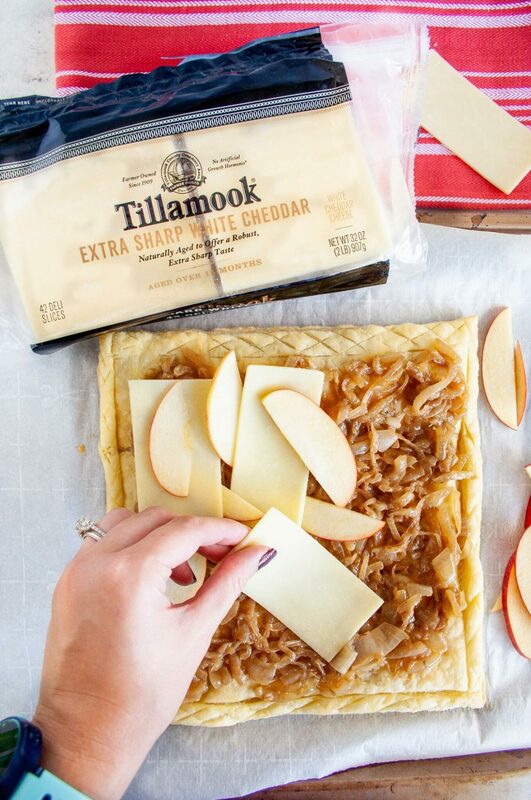 If you want to try this recipe, you can find these Tillamook Extra Sharp White Cheddar Slices on your next Costco trip, available now through November! Party tip: Costco is your best friend when throwing a Friendsgiving, dinner party, or Thanksgiving dinner. Stock up on large selections and then use leftovers to fuel the rest of your week. Currently, I’m snacking on the leftover Extra Sharp White Cheddar slices with almonds and dried cranberries, as I write this. In the comments, tell me about your go-to fall recipes. What recipe is your go-to take to fall parties? Let me know if you’d like to see more of these easy but elegant entertaining recipes.